Mon., May 13, 2013, 1:40 p.m.
BOISE – With a “difficult” fire season looming, across-the-board budget cuts are now hitting federal firefighting agencies, meaning hundreds fewer firefighters will be deployed to fight wildfires across the nation this year. 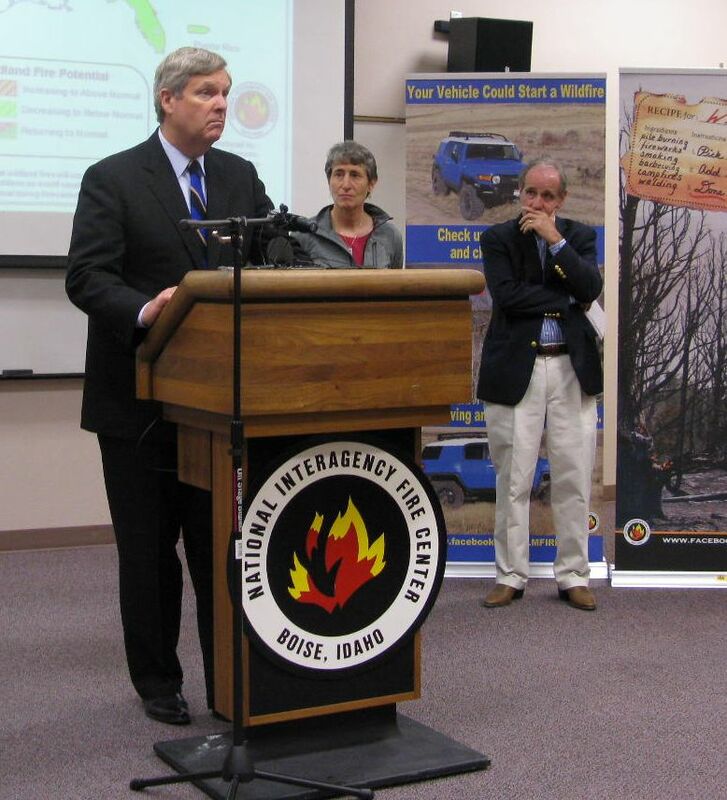 The Forest Service alone will have 500 fewer firefighters this year than last year, and 50 fewer engines, Vilsack said. That means things like replanting and efforts to reduce hazardous fuels will suffer. U.S. Sen. Jim Risch, R-Idaho, said if catastrophic fires are burning in August and sufficient resources aren’t available, he believes Congress would come through with emergency funding. Jewell called on citizens and communities to be “fire-wise” and take steps to protect their homes, particularly those in or near the woods or wildlands, from burning in a wildfire. “We as private citizens … play an important role,” she said, “especially in these areas where we want to live, have our cabins up in the mountains, and they are oftentimes in harm’s way.” Jewell said people need to create defensible space around homes or cabins, clear brush, trees and flammable materials, and help their neighbors do the same. “I really encourage you to do that,” she said. This year’s fire season already has seen 13,000 fires start, but that’s actually a low number – the lowest in the last 10 years. That’s mainly because there’s been ample rain and snow across the eastern United States, limiting the fires that otherwise would normally have ignited by now in the Southeast. But this year is expected to see above-normal risk in parts of the west, particularly the southwest, due to precipitation that’s run far below normal. Southern California has gotten only a quarter of its normal precipitation so far this year. NIFC officials said the wildfire season in West Coast states is expected to start a month earlier than normal this year as a result; fires already have been burning in southern California and even in southern Idaho. The Inland Northwest, including the North Idaho Panhandle and much of eastern Washington, however, is likely in for a normal fire season, with the edge of the above-normal risk extending only as far north as Yakima and north-central Idaho. Published: May 13, 2013, 1:40 p.m.